On 9 June 2011, I attended a medical networking event at the Oxford and Cambridge Club in London. At the end, a man with an American accent stood up and spoke about how backward our NHS was, and about how everything was about to change as we adopted a ‘modern’ US style healthcare system. Having worked in the US and experienced first-hand the striking contrast between both systems, I stood up and responded. The NHS is an excellent model for cost-effective universal healthcare, promising equal access to high quality healthcare without fear of bankruptcy when patients are at their most vulnerable. The US, despite all its innovation and technology in various cathedrals of excellence, spends far more on healthcare with worse outcomes and denies healthcare to its weakest. Less than four years later, that vision of a US style healthcare system is being realised in the UK at a faster pace than many of us imagined possible. The NHS has been reorganised and is now on its knees with flat-line funding since 2010, morale at an all-time low and more threatened ‘efficiency’ cuts. The Health and Social Care Act passed in 2012 set this government’s agenda for disruption of the NHS. It had two main effects. A. Control of the NHS budget was handed to GP-led Clinical Commissioning Groups (CCGs) that were doomed to fail without adequate support. CCG support services have sprung to their aid, so that many jobs previously done by the NHS for the NHS (eg. the design of future services) will now be carried out by companies like KPMG, McKinsey and US health insurer United Health (1). Note that in 2010, KPMG’s head of global health believed that ‘in the future, the NHS will be a state insurance provider and not a state deliverer of healthcare’ (2). B. CCGs are also being forced to open up every part of the local health service to private companies. Time-consuming tendering processes in which the NHS is no longer the preferred provider will lead to expensive bidding contests. In the US, administrative costs account for 20% of healthcare costs compared to 7% in the UK (prior to the 2012 Act). Private organisations will cherry-pick profitable services, leaving NHS providers to mop up less profitable work. In order to save the NHS, the Health and Social Care Act 2012 must be revoked. The NHS must become the preferred provider of healthcare services to protect it from competition. We must resist changes that will make the NHS even more expensive and unaffordable. Electoral promises to pour £8 billion into the NHS mean nothing if the money flows out of the NHS and into private hands. Add to this equation the impending TTIP (Transatlantic Trade and Investment Partnership) between the US and EU which would make it impossible to reverse these changes, and the future of the NHS starts to look very bleak. Cameron has described fears that TTIP might damage the NHS as ‘bogus nonsense’ (3). If like me you regard the NHS as a national treasure to be defended from global corporate interests, and if you agree that all of us (and especially the most vulnerable amongst us) should have access to healthcare free at the point of delivery without fear of bankruptcy, then please consider all of the above when casting your vote tomorrow. This blog had had 910 views by day 4. To see my 'Elevator Pitch' on NHS reforms in 2013, see here. A surge in hospital activity over winter months is predictable, yet this winter we face unprecedented challenges at the frontline. There is much talk of an A and E (Accident and Emergency) ‘crisis’ but A and E represents only one of several interfaces within the healthcare structure. 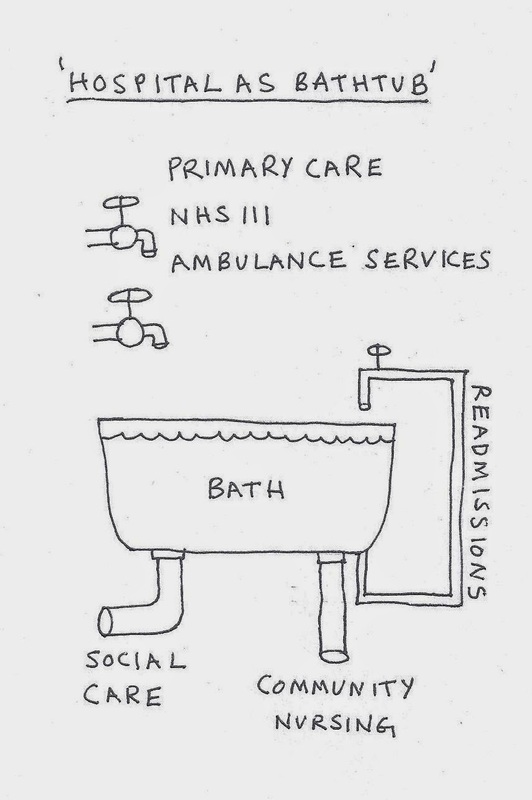 Consider the following simplistic bathtub model of hospital flow to look at how primary care, secondary care and social care interface with each other. 1. The hospital is a bathtub. If the size of the bathtub reflects the number of hospital beds, we have in the UK the smallest bathtubs in Europe (half as many beds per head of population compared to France; see here to compare). 2. The water level in the bath is determined by patient flow into the hospital (via the tap) and out of the hospital (via the outlet pipe). The tap in turn is determined by a number of factors including the following: access to primary care, telephone advice (NHS 111), and patient choice (to attend the ED rather than see a GP). 3. Flow out of the hospital on the other hand depends on patient recovery, access to rehabilitation beds and social care. 4. There is an additional re-entry circuit: when flow through the backdoor is obstructed and social care is unable to cope, outflow is diverted back to inflow (the hospital readmission). Recent changes to the NHS have had an impact on this model at both ends. Recent changes mean that the tap has been turned to full. The number of district nurses, who play a crucial part in keeping people out of hospital, has fallen by 40% over the last decade. General practice, the jewel in the crown of the NHS, is also vital to keeping people out of hospital but now being stretched to breaking point. Recent changes following the Health and Social Care Act 2012 have distracted GPs from their clinical work and led to older GPs seeking early retirement. Patients are finding it harder to access primary care and opt instead for the emergency department (ED). 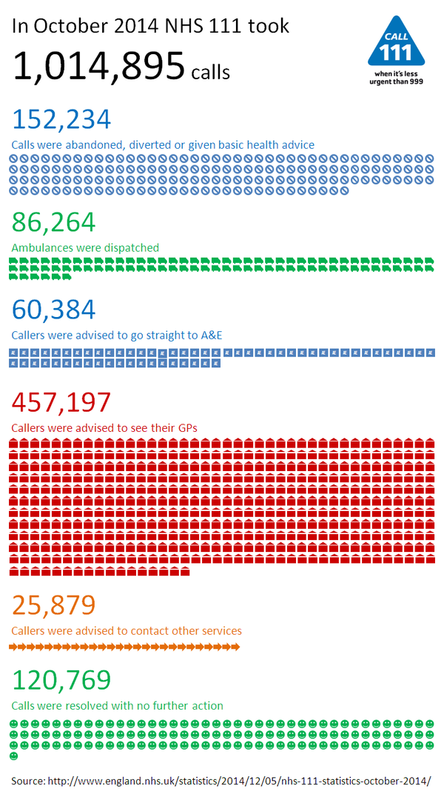 NHS 111 is sending larger numbers of patients to the ED (see below). At the same time, the flow of water out of the bath is being blocked. Social care cuts have made it harder to get patients home. Many smaller cottage hospitals, rehabilitation facilities, and nursing homes have been closed. At the easiest of times, hospitals are run at 100% capacity for maximum efficiency. But open the taps to full by overwhelming primary care, then plug the outlet pipes by cutting social care and rehabilitation beds, and the bathtubs of the NHS, no matter how efficient, will overflow when winter arrives.